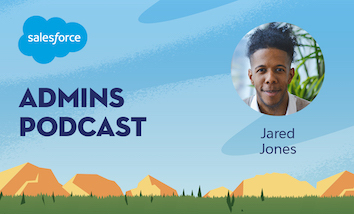 This week on the Salesforce Admins Podcast, listen to the dulcet tones of Jared Jones, Junior Implementation Architect in the Customer Success and Growth Organization at Salesforce. He shares his amazing story and tells us how he’s transitioned his career from hospitality to his current role in implementation, as well as his passion for Service Cloud. 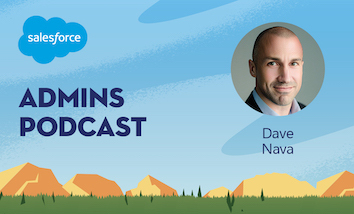 Join us as we talk about how curiosity led him from hotel management to Salesforce, how he transformed his team at Salesforce with Salesforce, and how he was able to put himself in front of management and get the support he needed. You should subscribe for the full episode, but here are a few takeaways from our conversation with Jared Jones. A rock star at heart. Growing up (and still), Jared wanted to be a rock star, he majored in jazz and classical piano, played trombone professionally for 12 years and he still plays guitar professionally around his work schedule at Salesforce. They’ve even created a secret Salesforce society of musicians called Jamforce to get together and rock out. So how did he go from working musician to Salesforce Architect? “My journey to Salesforce was very random and completely unplanned,” Jared says, “but as soon as I got here I immediately was like this is what I’m supposed to be doing this is awesome.” He worked in hospitality for about 8 years. The Real Estate organization at Salesforce happened to be trying to build a “hotel-esque” hospitality experience, so they were looking for people with experience to help build that. Jared ended up as a Workplace Service Coordinator, basically the front desk of the HQ offices. That’s not necessarily a very technical role, but Jared was able to make a transition. “Most of the people on that team, to this day, don’t really know what Salesforce does and certainly don’t know the products,” he says. He had encountered a proprietary CRM in his previous work, so when he realized Salesforce was the same basic idea, he got really excited about how he could use it at the front desks at HQ. That lead him to Trailhead and the start of a new chapter. When Salesforce needs the help of… Salesforce? “It was kind of whirlwind,” Jared says, “there was a trail called CRM basics or essentials so I read that and it really breaks down, from the very beginning, what is a CRM, why do you need one for your business, and then what does Salesforce have to do with that and things started clicking for me.” Really, he was just looking for an excuse to learn more about the technology and apply it to his team. “Doing just a few basic trails, I learned that our team was a perfect use case for the platform,” he says. “One of the first things I recognized was that there was too much manual doing of things that could’ve been done not manually,” Jared says. They literally used a hand clicker and a spreadsheet to track visitors, for example. Almost everything was handled with email, “I was thinking, ‘I’m pretty sure Salesforce has a solution for this, I don’t know a lot about it but I’m pretty sure we can make it happen.’” Why wasn’t Salesforce using Salesforce, he wondered. Jared set about using a Trailhead playground to build custom objects to track things like deliveries. Once he had some things built, he worked with his manager to start implementing them. She connected him with the Technology Director of Real Estate, which gave him system administrator access to a full-production, 1,000 user license org that no one was using. Once he got the keys to the car, so to speak, he was able to really build things out and make a very persuasive presentation and ended up working on his project full-time. One of the things that came up pretty quickly was the problem of scalability. “My app worked great for our offices, but if we were to roll it out globally it would break immediately,” Jared says. In learning more about the data model and solving those problems, he was able to get some certifications that caused people to take notice. “I’m like the Spider-man of Salesforce, I guess, I got bit by the Trailhead bug and now I’m trying to sling webs of Salesforce knowledge to anyone around me,” he says. “I was having a networking chat with an executive from the Customer Success and Growth, and very suddenly he said, ‘I think you need to change up your idea of what your career path is and you should come to CSG,’” Jared says. He started as a made-up position called a Product Associate Analyst, but his passion led him to learn more and get more certifications that lead him to the Junior Architect role he’s in now. Nerding out about Service Cloud. As a Service Cloud nerd, Jared says that “there’s a lot of just totally simple things that change the lives of the agents using them.” One of the best things you can do is to set up the Agent Console with components like Quick Text, Macros, and Live Agent in one place. “I’m a really big fan of Live Agent and Snap-in Chat,” Jared says, which allows you to easily put chat right in your website. Knowledge is also a powerful tool, giving your customers a way to help themselves. Really, it’s about putting agents in a position to succeed and help customers more effectively. If you have any questions for Jared, feel free to reach out on Twitter. “I would pay to talk about Salesforce, that’s how exciting I find it,” he says. Subscribe today or review us on iTunes! 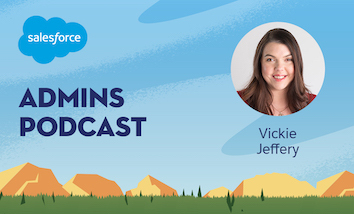 Gillian Bruce: Welcome to the Salesforce Admins Podcast, where we talk about product, community, and careers to help you become a more awesome Salesforce admin. I’m Gillian Bruce, and today we’ve got an amazing guest joining us on the podcast. We are going to be joined by Jared Jones, who has an incredible story. He also has a really good voice for podcasts, which you’ll realize. Gillian Bruce: Jared works here at Salesforce. He is the junior Implementation Architect within our Customer Success and Growth organization. 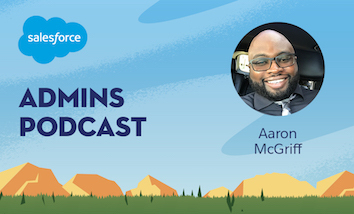 He’s got an amazing career story about how he’s completely transitioned his career from basically working in hotels and hospitality to now being an implementation architecture at Salesforce. Gillian Bruce: He also is passionate about Service Cloud, and we are in the middle of a whole bunch of great Service Cloud content coming to you at admin.salesforce.com, so make sure you go check that out, and maybe what you hear from Jared will inspire you a bit. So without further ado please welcome Jared to the podcast. Gillian Bruce: Jared, welcome to the podcast. Jared Jones: Thank you. Thanks for having me. Gillian Bruce: We are so happy to have you here. Here we are at HQ in San Francisco, so it’s always nice to do these in person. I wanted to introduce you a little bit to our audience by asking you the question I ask most of our guests, and that is, Jared, what did you want to be when you grew up? Jared Jones: What I wanted to be was a rock star. I’m pretty it was a rock star. It still is a rock star, actually. So I’m still aspiring to be a rock star when I actually grow up. Gillian Bruce: Okay. Tell me a little bit more about that. Jared Jones: I’ve been a professional musician for most of my life. Majored in music in college, jazz and classical piano, in college, and played trombone professionally for 12 years. Play guitar professionally now, and that’s still a huge part of my life. I teach kids when I can on weekends, and I’m still trying to make something come of music alongside in Salesforce and seeing if I can bring those two things together, those two worlds. Gillian Bruce: I love it. That’s great, musicians in Salesforce. There’s actually quite a few people that I’ve talked to that have music backgrounds or are musicians in addition to being in the Salesforce ecosystem, so I feel like there’s some kind of a secret Salesforce musician’s society somewhere. Gillian Bruce: There you go. See, my suspicions were correct. Gillian Bruce: So Jared, tell me a little bit about how you going from wanting to be … continuing to wanting to be a rock star and being an [inaudible 00:02:56] musician to being a part of the Salesforce Ohana and the Salesforce ecosystem. Tell me a little bit about your journey to Salesforce. Jared Jones: My journey to Salesforce was very random and completely unplanned. I kind of fell into it on accident, and as soon as I got here I immediately was like, this is what I’m supposed to be doing. This is awesome. Jared Jones: I was working in hotel management for eight years, Hilton, Marriott, and the real estate organization here was actually trying to build like a “hotelesque” hospitality experience. So they were hiring people to build that and create that foundation here. So I ended up actually working as a Workplace Service Coordinator, which is like the front desk basically of all of the HQ offices. So the reception team, and the badge security, and a lot of administrative stuff. So it just came about randomly like that. Gillian Bruce: Okay. So you go from basically kind of the hospitality industry to learning about and encountering Salesforce. I mean tell me a little bit about that transition. You said came in kind of in this workplace services role. It’s not necessarily a technical role right off the bat, but now you are doing a more technical job. So tell me a little bit about making that transition from hospitality to tech. Jared Jones: Yeah. Even in the real estate organization there was no tech. Most of the people on that team to this day don’t even really know what Salesforce does, certainly don’t know the products. Jared Jones: So I naturally had kind of an interest in it, because while working in hospitality Hilton had their own proprietary CRM. I don’t know how much I can say about that, and I didn’t know that that wasn’t specifically Hilton’s thing. I didn’t know that CRM was a type of technology. Jared Jones: So as I got here and I was like, oh, CRM is a thing that you use, it’s not just Hilton’s proprietary thing … So I got very interested in how we could try to use some of that at the desks at the HQ offices in San Francisco. I wanted to learn more about the product, so I just looked into Trailhead, by the recommendation of a friend, and looked into Trailhead and see what the product lineup is and see how all the technology works. Gillian Bruce: Okay. So you’re basically in the real estate part of Salesforce, and you have been led to Trailhead. So you start using Trailhead to learn a little bit more about the platform, which you had kind of a familiarity with what a CRM is, but in a different context. Gillian Bruce: So tell me about that learning experience from shifting worlds a little bit, getting exposure to CRM, but then learning more about the Salesforce platform via Trailhead. Tell me what that was like for you. Jared Jones: It was kind of a whirlwind. It was very confusing in the begging, because I was like, wait, the clouds and the CRM and then platform, and what is all this terminology mean? So I was able to look through … there’s a trail that’s like CRM basis or essentials, and I was like, oh, I need that. Jared Jones: So I read that, and it really breaks down from the very beginning what is a CRM, why do you need one for your business, and then what does Salesforce have to do with that? And I was like, oh. Things started clicking for me, and I was really trying to look at ways that I could use it on my team. I was just really looking for an excuse to learn more about the technology and apply it to our team, and doing just a few basic trails learned that our team was like a perfect use case for the platform. Gillian Bruce: That’s great. So let’s talk a little bit about that. So you’re seeing an immediate use case for the technology you’re learning at Salesforce. What were some of the problems that you saw with … some of the challenges that you saw in your existing team that you thought Salesforce might be able to help with? Jared Jones: One of the first things that I recognized was that there was way too much manual doing of things that could have been done not manually. We rent out badges for the employees and for visitors, and every time we would give one out we had a little hand clicking device that we would click every time we rented out a badge. We would record those numbers at the end of the day in a spreadsheet, and then the next morning we would also record the numbers from that morning in case things moved around in another spreadsheet. Jared Jones: There was a lot of that kind of working. A lot of things were done via email, and by a lot of things I mean literally everything. If people had requests of any kind for registration things, it was all done via email, and I was thinking, I’m pretty sure Salesforce has a solution for this. I don’t know a lot about it, but I’m pretty sure we can make that happen. So I just started digging around. Gillian Bruce: Why isn’t Salesforce using Salesforce, right? Jared Jones: That’s a huge issue, yeah, for me. Yeah. Gillian Bruce: Yeah. I mean you talk about spreadsheets and emailing spreadsheets around. We always say a spreadsheet is an app asking to be made. Jared Jones: That’s great. I haven’t heard that one. That’s great. I love that. Gillian Bruce: Yeah. So LeeAnne Rimmel, who is one of our fellow admin evangelists, she always says a spreadsheet is just a app asking to be created. Jared Jones: That is amazing. I’m going to write that down. Gillian Bruce: Yeah. She’s totally happy sharing that with everybody. Gillian Bruce: Okay. So you see some of these use cases, and then were you just building this on your own to test and see how you could customize the platform to solve these use cases? Jared Jones: Yeah. I was kind of doing it one by one. So as I saw a need I was like, okay, so we need to figure out how to log when a delivery comes in. So I need to make a custom object for deliveries. I really didn’t know what I was doing. It was literally learning on the fly as I went in a Trailhead playground. I was using a Trailhead playground to build these experimental custom objects, and that’s kind of just how that started. Gillian Bruce: That’s great. Okay. So you’re kind of building this app for you’re team to use. Gillian Bruce: Then how did you share that? Did you start just kind of talking about it with your management or your fellow peers? How did you start sharing what you were building and what you were learning? Jared Jones: Yeah, I actually had a really supportive manager for this, fortunately, at the time. She’s since left Salesforce, but I was able to talk to her, and she said this is great. We need a way to streamline everything that we do. If you want to continue building this, you should probably talk to the technology director of real estate. Jared Jones: I ended up getting system administrator access to a full production 1000 user license org from his team that no one was using. I said, “Can I build in this?” And they said, “Yes.” So I spun up a sandbox, and I was able to demonstrate with a presentation and say, hey, this is the actual business value just like the trails on business value presentation say. This is the business value again. This is the ROI if this actually costs any money, the time that you’re saving is equatable to this amount of dollars, et cetera. And they loved it, and they said, “Okay. Just continue working on this.” So I did. Gillian Bruce: That’s great. I mean, talk about just putting Trailhead to work for you. Gillian Bruce: Those things that you’re learning in the different modules, not just the technical stuff, in terms of how to position it to stakeholders and demonstrate that ROI, put together a presentation, and share what you’re building, and the why you should do this and invest in this. I mean, that’s huge. We talk about tech skills that you can learn on Trailhead all the time, but we don’t always talk about the soft skills that are also on there, which are really important. Gillian Bruce: Actually, I don’t even like the term soft skills, because it’s a weird term. But it’s the non-technical skills. The people skills and the business skills. Gillian Bruce: Alright. You basically sought this opportunity out and just started building a thing, because you’re interested in learning. What happened next for you? You’re getting full license to build out this environment. You are now an admin for an org. What happened next? What was the next step in your journey? Jared Jones: I started realizing some of the errors of my ways in how I was going about things, and I needed to get a more complete understanding of the platform in order to be effective. Because it turned out, the first time that I built the app it worked great for these offices, but if they to roll this out globally it would break immediately. Jared Jones: So I had to rebuild it for scale, and I learned a lot about the data model that way. I was able to go and get some certifications, because of what I had been learning about the data model and the platform and how everything works together. And once I started doing that people started taking notice, and they also noticed that I was really enthusiastic about our products, and wanting to share that with other people, and get other people trained up on Trailhead, and started evangelizing Trailhead, started evangelizing Salesforce, and it just started taking off. Gillian Bruce: … here you are. Jared Jones: I’m the Spiderman of Salesforce, I guess. Jared Jones: Got bit by the Salesforce bug, and now I’m trying to sling webs of Salesforce knowledge to everyone around me. Jared Jones: In the blue suit. Gillian Bruce: … webbing different clouds and pulling it together. Yes. Exactly. This is great. I hope somebody creates a great visual about this. It’d be fabulous. Jared Jones: Somebody should make a comic, I think. That would work. Gillian Bruce: It’d be awesome. Alright. So you are evangelizing Salesforce. You have built this thing. Your team is excited. It’s helping streamline processes. And you’re still in the real estate group at this point. What happened to help you transition into, now, your role as an Implementation Architect? Jared Jones: I was moved very suddenly. I was having a networking chat with a lot of different people, and ended up chatting with an executive from the customer success group, Success Cloud. He very suddenly said, “I think you need to change up your idea of what your career path is, and I think you should just come to CSG .” And I said, “Okay. Why do you think that?” And then he said, “You like customers, you like building, you’re really excited about the product. You should be able to support people. And so today you are now in CSG.” There was no conversation about would you like to be? There was nothing. It was just, you are now in CSG. Jared Jones: And that was probably the major turning point for me in terms of the momentum that I was going to build from then on out. I started off as a made up position called a Product Associate Analyst in CSG, and I was helping develop, accelerate, our library content on Service Cloud, which is my favorite product, which is how I ended up on that team. And from there I just learned, and trained, and earned a bunch of certifications while in that position. Really increased my product knowledge and how to talk to customers. Just recently, there was a reorganization of our department, and I landed in a role that they thought I would fit way better in based on the things that I had done. And I couldn’t be more excited when they said you’re going to moving over to the implementation architect team. I said, “That is amazing. It’s exactly what I wanted to do.” I love working with customers, I love the software, I love the technology, I love our culture of innovation and customer success. Jared Jones: Again, it just kind of happened very suddenly, but I feel like it’s a perfect fit. Gillian Bruce: That’s awesome. So for folks who may not know what CSG stands for at Salesforce it’s Customer Success and Growth. Correct? Gillian Bruce: It’s the organization that basically supports all of our customers in trying to accomplish their goals and customize Salesforce to better serve their businesses. Gillian Bruce: Correct me if I’m wrong. I’m not in CSG. Gillian Bruce: Yep. That’s why I like to explain them on the podcast. Jared Jones: Yeah. Success Cloud is how we explain our role. Success Cloud is a product. You can buy Success Specialists. You can buy Implementation Architects to help you succeed. We will work with you, alongside you, however you prefer. Or if you want to do it yourself we’ll talk to you about how to do that. We’re here for success of the customer, and it’s really exciting to be a part of that. Gillian Bruce: That’s awesome. You mentioned Service Cloud as one of your favorite suite of our products. Gillian Bruce: … right now, and I’d love to kind of talk to you a little about some of your favorite Service Cloud features that you find are really helpful from an admin perspective. Jared Jones: That’s a great question. Gillian Bruce: Yeah. We don’t talk about Service Cloud a lot. We talk a lot about Sales Cloud, occasionally some Marketing Cloud, occasionally some Community Cloud. But I’d love to kind of pick your brain a little bit as a Service Cloud nerd to talk to us a little bit about some features that maybe admins should think about using that they don’t normally think about. Jared Jones: Sure, sure. There’s a lot of really simple, just easy, things that totally change lives of an agent. I like to distinguish between Sales Cloud and Service Cloud in this way. Sales Cloud is a lot more about reporting and operational excellence and efficiency. Service Cloud really is about enabling your agents. Jared Jones: One of my favorite things is just really setting up the agent Console, maximizing, getting the most use out of that. I think most organizations have it, and maybe it’s even turned on, but they haven’t used all of the components that they could use. You can use Quick Text and Macros. You can have Live Agent. You can all of that in one place. I’m a particularly big fan of Live Agent and Snap-ins Chat. It allows you to put a little Snap-in code, snip it into your website, and you can embed a chat service right there. That’s a great way to open up channels that are not expensive to reach customers the way the want to be reached. Jared Jones: Digital engagement is a huge part of service, and so tools like Live Agent and like Omnichannel for routing your cases the most efficient way possible, and even using Knowledge. Knowledge is a great, great way to reach customers and give them some self-service options. So just kind of a combination of those features. You can go really far and get really technical and in-depth with those, but I think just having those available in your Console, having them accessible from your Console is a really easy and simple way to give your agents the tools they need all in one place. Gillian Bruce: Yeah. This idea of Console, for me, I only started using and checking out Console when Console came to the Lightning platform. In classic, if you were using Sales Cloud Console was not a thing. It originated from the Service Cloud, and now I cannot a use case for building a Lightning app that is not a Console app. It is so much more efficient, because you get all of your Salesforce tab on one page instead having to open up multiple browser tabs, and just kind of work all in there. Gillian Bruce: I think another fun thing that’s come from cases in Service Cloud is that split list view. Gillian Bruce: It’s one of my favorite things. Jared Jones: You can still see the list. Gillian Bruce: … the list of records. Jared Jones: Yeah. The efficiency of the Console is so incredible. And you don’t have to leave a screen to see other things. And then there’s the tabs and the sub-tabs. That’s relatively new. That just makes navigating from case to case so much easier. Gillian Bruce: And you mentioned some things about Live Chat and Omnichannel. These are things that are so useful, I think, for admins to think about, especially if they work in a service-based organization or helping their agents be more efficient. Gillian Bruce: Yeah. I’m sure people are … on Twitter our listeners are going to be like, hey, Jared, so tell me how you did X, Y, and Z? I want to know. Jared Jones: Hey, yeah, absolutely. I’m always happy to talk to people about that. I would pay to talk about Salesforce. That’s how exciting I find it. Gillian Bruce: Don’t tell anybody that. Jared Jones: Oh, I mean … yeah. It’s true. I think … I enjoy it. No problem. If anybody has questions or want to reach out I’m around. Gillian Bruce: That’s great. Well, I so appreciate you sharing your story. You’ve done an incredible thing with your career in terms of completely transitioning it, and now … I hear the passion. I see the passion that you have for helping other people learn Salesforce, and helping improve the way that their business runs. So I am so excited for you and your role now. Gillian Bruce: It’s going to be really fun to see what you do next. I mean, even just the app that you built to help badge check in and out be more efficient is awesome. I hear so much of that self-initiative and that motivation and that drive from you that I think a lot of our admins have. So I am inspired by your story, and I really appreciate you sharing it with us. Jared Jones: Awesome. I’m glad I can inspire someone and I hope that admins listening to this take a cue and get on Trailhead and empower your knowledge and your career. Take it forward. Gillian Bruce: Well, on that note, before I let you go, I’m going to ask you a lightning round question. Jared Jones: A lightning question. Alright. Gillian Bruce: Okay, so, it’s the first thing that come to mind, no right or wrong answer. Jared Jones: This could get interesting. Gillian Bruce: Alright. Especially in your previous role, you had a lot of exposure, probably, to our ridiculous stickers and mascots that we have. Gillian Bruce: What is your favorite Salesforce mascot? Jared Jones: Oh, easy. Blaze. Gillian Bruce: Blaze. Tell me more about Blaze. Jared Jones: Blaze is the icon of customer success and innovation at Salesforce. So he is the representation of CSG, where we empower and inspire our customers, and everyone, to blaze a trail. That’s why her name is Blaze. To always be pushing the edge of what you think is possible, and go to the next level. That’s what Blaze represents. Jared Jones: Yeah, which is awesome. Jared Jones: I could have mentioned that. Gillian Bruce: It’s a podcast. We don’t have a visual. Jared Jones: I keep forgetting that people don’t know who Blaze is. Gillian Bruce: For us dog lovers, I’m a huge fan of Blaze. So, yes. Jared Jones: Awesome. Yeah, that’s another great reason. Gillian Bruce: Well, Jared, thank you so much for taking the time to chat with us. And I am so inspired by your journey. I’m excited to see what’s next. And watch out, because now you’re going to have a whole bunch of new admin fans on Twitter and the Trailblazer community. Jared Jones: Awesome. Well, thanks very much. It’s been a pleasure talking with you, Gillian. Gillian Bruce: Huge thanks to Jared for taking the time to chat with us and share about his story. And oh my gosh! Can you hear the passion in his voice? It was palpable. So I hope that some of that passion that Jared has for evangelizing what Salesforce can do as a tool and for your career reached the air waves and crept into your brain. Gillian Bruce: Some of the things I really wanted to highlight from our conversation was how Jared really went from hotel management to Salesforce simply by being curious. He discovered he had a natural interest in CRM systems, because he was interested in how information was getting organized and things were getting automated and connected. And he put the pieces together when he was in that workplace services role here at Salesforce. Seeing opportunities to take manual processes that his existing team is doing using spreadsheets, and bringing them into Salesforce and really using Salesforce as a tool to help that team run smoother. Gillian Bruce: And as he was doing that, he was learning with Trailhead, wanting to put those skills to the test, and he was very vocal about what he was doing, and the business value, and the return on investment. And by stressing that and really putting himself in front of management explaining why this mattered, he got support and got go ahead and got buy in to implement solutions to get access to a production org, and actually build out some custom objects and some apps that helped his original team work better, and better serve the company. And guess what? As he did that people started to recognize his abilities, and that’s how he opened doors, and that’s now he has transitioned into his role with Customer Success and Growth.